TECVAL DBB-01 series, enables you to reduce drastically space and weight in the process of installations. It reduces the possibility of leaks and the maintenance. 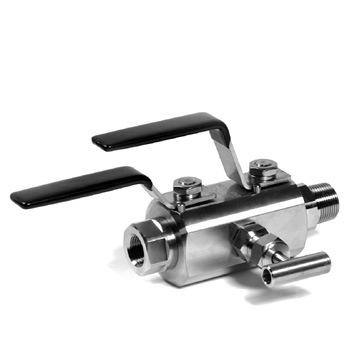 Their distribution diagram consist of two ball valves to block the line and one needle valve to bleed in 90º outflow. Standard reinforced PTFE seats up to 100 bar (1500PSI). Anti-leak ball stem with double o-ring seal. PEEK seats for high pressures up to 250bar (3600PSI). Inlet, outlet and vent ports screwed BSP.